2014, XII, 329 p. 124 illus. How can we deal with the diversity of theories in mathematics education? This was the main question that led the authors of this book to found the Networking Theories Group. 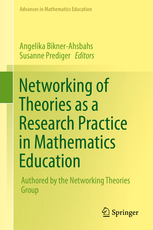 Starting from the shared assumption that the existence of different theories is a resource for mathematics education research, the authors have explored the possibilities of interactions between theories, such as contrasting, coordinating, and locally integrating them.The book explains and illustrates what it means to network theories; it presents networking as a challenging but fruitful research practice and shows how the Group dealt with this challenge considering five theoretical approaches, namely the approach of Action, Production, and Communication (APC), the Theory of Didactical Situations (TDS), the Anthropological Theory of the Didactic (ATD), the approach of Abstraction in Context (AiC), and the Theory of Interest-Dense Situations (IDS).A synthetic presentation of each theory and their connections shows how the activity of networking generates questions at the theoretical, methodological and practical levels and how the work on these questions leads to both theoretical and practical progress.The core of the book consists of four new networking case studies which illustrate what exactly can be gained by this approach and what kind of difficulties might arise.